Here is an update on digital camera market performance in 2012. The Camera and Image Products Association of Japan provides data on the number of units produced, shipped and their value. Most major digital camera vendors participate in this research. With a majority of digital camera vendors hailing from Japan, the data from CIPA is a good proxy for the industry. Let us read into the trend based on the shipment data. SLR camera unit shipments continued to grow. 2012 saw 28% more shipments. 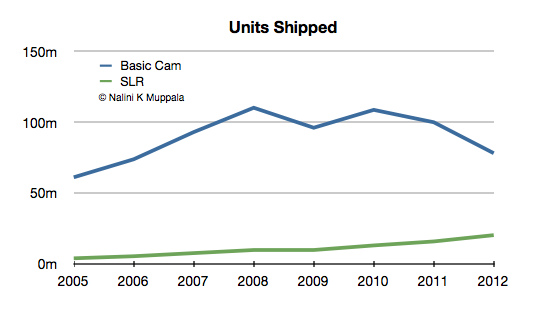 One in 5 digital cameras shipped was an SLR. Basic camera shipments continued to decrease. 2012 saw 22% fewer shipments. This is the worst drop since 2006. 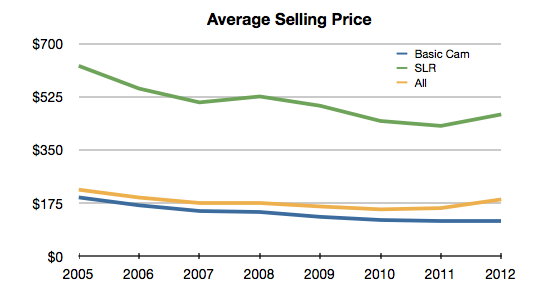 2012 saw a break in price erosion of the past several years. Basic cameras held the price. SLRs on the other hand reversed the trend and sold for higher price. Price of basic camera, on average, held steady at $115. SLR camera ASP went from $429 to $467. On the whole ASP improved significantly to $187. 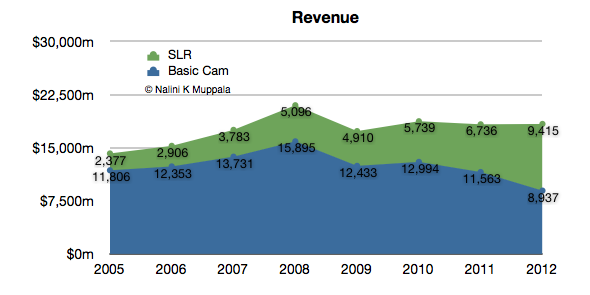 SLRs accounted for 51% of total revenue. Revenue from basic cameras fell by 22%. SLR revenue increased by 41%. All the above charts are based on US Dollar equivalents (1 JPY = 0.0125 USD) of prices and revenues reported in Japanese Yen. The following table shows growth rates of various aspects.